The 1931 FA Cup final was an all West Midlands affair as West Brom took on Birmingham City at Wembley Stadium. 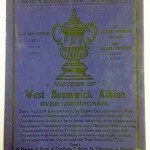 This was Birmingham’s first final to West Brom’s seventh, and The Baggies took their third FA Cup title with a 2 – 1 win courtesy of a brace from WG Richardson. 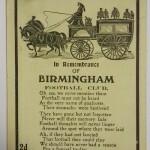 Here we have a memorial postcard for the Birmingham fans lamenting their loss, along with a rare winners postcard (note Wembley is incorrectly spelled ‘Wembly’..) which looks back on all the teams beaten by The Baggies on the way to the cup.